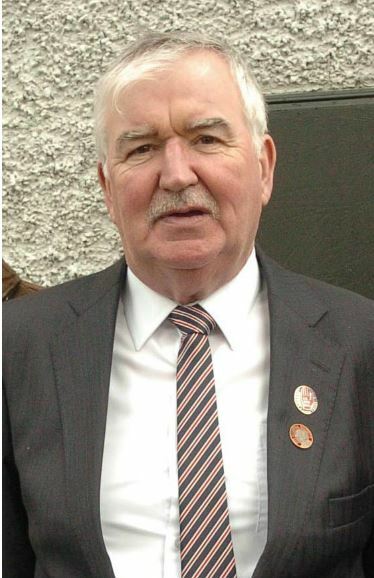 The Cork Mother Jones Committee is saddened to hear of the passing of Tommy Grimes from Kells, Co. Meath. Tommy was the founder of the Jim Connell festival in Kells which set about reviving the memory of Jim Connell, who wrote the words of the Red Flag, anthem of much of the labour movement. Tommy attended the Spirit of Mother Jones festival in Cork on a number of places as did a number of his colleagues from the Jim Connell festival committee. He was very interested in our festival and we were delighted to make contact with him and his committee. Our sincere sympathy to Tommy’s wife Anne and his children Gillian, Alan, Helen and Lauren and extended family and circle of friends and indeed all those involved in the Jim Connell Festival. He passed away in St Francis’s Hospice, Blanchardstown, on Tuesday. Mr Grimes was a former chairman of Kells Town Council and a commited trade unionist. He will be best remembered for his involvement in the Jim Connell memorial event in Crossakiel, commemorating the author of ‘The Red Flag’, and since his retirement, offered advice on workers’ rights on an informal basis through Kells People’s Resource Centre. Tommy is survived by his wife Ann, daughters Helen, Gillian, Laura, son Alan, sister Lil, Rosemary, Patricia, Jane, Phil and Ann, brother Christy, grandchildren Ceaillaigh, Evan, Sophia, Jack, Caitlin, Larragh, brothers-in-law, sisters-in-law, sons-in-law, daughter-in-law, nephews, nieces and a very large circle of family and friends. He was predeceased by his parents, Tommy and Mary, and his brother Pa. Burial took place at St. Colmcille’s Cemetery, Kells on Thursday, 24th March.